TEHRAN, Iran (CNN) -- The European Union, France and Britain denounced Iran's ongoing mass trial after two embassy employees and a French citizen appeared in court Saturday on charges related to post-presidential election violence. French national Clotilde Reiss, right, and British embassy worker Hossein Rassam, far left, in court. The French and British embassy employees and a French scholar were among 100 defendants who appeared in Tehran's Revolutionary Court as a mass trial of Iranians and others resumed Saturday. The EU presidency, currently held by Sweden, said Iran will be held responsible. "The presidency reiterates that actions against one EU country -- citizen or embassy staff -- is considered an action against all of EU, and will be treated accordingly," the European Union said in a statement. "The EU will closely follow the trial and demand that the persons will be released promptly." Britain's Foreign Office also denounced the proceedings, calling them an "outrage." Among those named in court Saturday were Clotilde Reiss, a French academic working in Iran, and Nazak Afshar, an employee of the French embassy in Tehran. France called for the release of both women, saying the charges against them are unfounded. "France also stands against the conditions of that [court] appearance," the French foreign ministry said. "The embassy was not informed in advance nor permitted to attend the hearing, in accordance with international rules of consular protection. We regret that Ms. Clotilde Reiss and Ms. Afshar are not being assisted by a lawyer." The semiofficial Fars News Agency said Reiss admitted to her crimes in court Saturday and asked for clemency. "I shouldn't have participated in the illegal demonstration and shouldn't have sent the pictures, I am regretful," Fars quoted her as saying. "I apologize to the Iranian people and court and I hope the people and the court forgive me." Human rights groups and Iran's opposition leaders have accused the government of coercing such confessions. An analyst for the British embassy in Iran also was put on trial Saturday, the British Foreign Office said. Hossein Rassam was one of several British Embassy employees who were arrested. "This is completely unacceptable and directly contradicts assurances we have repeatedly been given by Iranian officials," a British Foreign Office spokesman said. Fars reported that Saturday's trial was for a second group of people accused of involvement in the unrest. The first trial was August 1. Defendants face a variety of charges related to the massive demonstrations held after President Mahmoud Ahmadinejad was elected to a second term. The government said he won by a landslide, but opponents accused officials of rigging the results. Hundreds of thousands of Iranians took to the streets to protest, calling the election results fraudulent, leading to the arrests of more than 1,000 people. Opposition leaders Mir Hossein Moussavi and former President Mohammad Khatami have blasted the mass trial, contending the detainees were forced into confessions through the use of torture. Britain made a similar accusation Saturday. "We deplore these trials and the so-called confessions of prisoners who have been denied their basic human rights," the British Foreign Office spokesman said. This week, human rights activists and Iranian intellectuals penned a letter to Navanethem Pillay, the United Nations High Commissioner for Human Rights. The letter describes human rights abuses in Iran and asks the Security Council to label them "crimes against humanity" and refer the issue to the International Criminal Court in The Hague, Netherlands. "This is a regime that in an organized manner arrests its opponents and critics and tortures them in solitary cells," says the letter, signed by 380 people. Human rights organizations have decried the mass trial, calling it a farce and a way to intimidate Iranians who speak against the government. Last week, top Iranian clerics and seminary students in the holy city of Qom also voiced their opposition to the trial, calling it "illegal" and "immoral." Iran's clerical establishment defended the trial, saying those arrested are enemies of the Islamic republic. In the weekly Friday sermon, Ayatollah Mohammad Emami Kashani said opposition efforts would prove futile. "Their [the enemies'] plots, conspiracies and moves against the Islamic Republic have all proved futile since the very first day [the Islamic ruling system was established], and they will remain so due to the vigilance of our nation which knows its enemies," Kashani said in his address at Tehran University, according to Fars. Among the defendants are Seyyed Mohammad Abtahi, a former Iranian vice president, and Maziar Bahari, a reporter for Newsweek magazine. 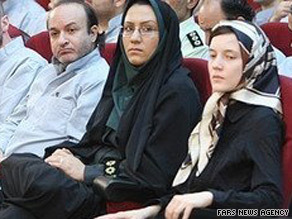 Abtahi's wife, Fahimeh Mousavinejad, told Human Rights Watch she learned about her husband's trial through media reports. She said that she had been able to visit her husband once, on July 30. "We sat together in a room where a video camera filmed us, and if we deviated slightly from personal affairs, we were reprimanded," she told Human Rights Watch. Abtahi "was weak and unhealthy, his body was shaking. He had lost more than 36 pounds. I was surprised to see him taken into court in that condition." The trial was to have resumed Thursday, but was postponed until Saturday because of a request by defense lawyers, state-run Press TV said. CNN's Shirzad Bozorgmehr in Tehran, Iran, and Per Nyberg in London, England, contributed to this report.